A suture is a type of fibrous joint (synarthrosis) bound by Sharpey’s fibers that only occurs in the skull (cranium). A suture ‘s fibrous connective tissue helps protect the brain and form the face by strongly uniting the adjacent skull bones. Sutures form a tight union that prevents most movement between the bones. Most sutures are named for the bones they articulate. Skull sutures visible from the side (norma lateralis) include the frontal, parietal, temporal, occipital, sphenoid, and zygomatic bones, while skull sutures visible from the front (norma frontalis) and above (norma verticalis) include those related to the frontal and parietal bones. Skull sutures visible from below (norma basalis) include the frontal, ethmoid, and sphenoid bones. fontanelle: An anatomical feature of the infant human skull comprising the soft membranous gaps. Sharpey’s fibres: A matrix of connective tissue consisting of bundles of strong collagenous fibers connecting periosteum to bone. suture: A type of fibrous joint which only occurs in the skull (cranium). A suture is a type of fibrous joint which only occurs in the cranium, where it holds bony plates together. Sutures are bound together by a matrix of connective tissues called Sharpey’s fibers, which grow from each bone into the adjoining one. A tiny amount of movement is permitted at sutures, which contributes to the compliance and elasticity of the skull. These joints are synarthroses (immovable joints). 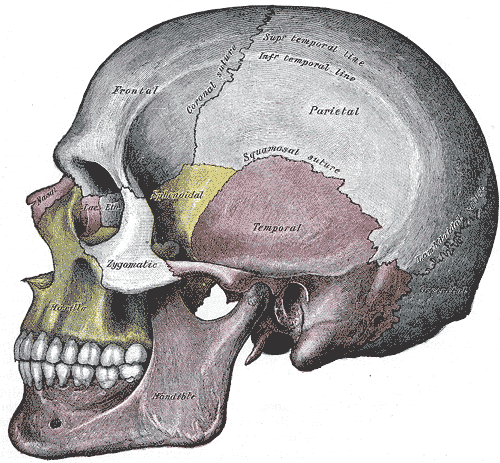 Cranial Sutures: Lateral view of skull showing the location of some of the cranial sutures. Sagittal suture: along the midline, between parietal bones. The fibrous connective tissue found at a suture (to bind or sew) strongly unites the adjacent skull bones and thus helps to protect the brain and form the face. In adults, the skull bones are closely opposed and fibrous connective tissue fills the narrow gap between the bones. The suture is frequently convoluted, forming a tight union that prevents most movement between the bones. Frontal suture top view: Drawing of human baby skull seen from the top. Cranial sutures are depicted with the frontal suture highlighted in blue. It is normal for many of the bones of the skull to remain unfused at birth. The fusion of the skull’s bones at birth is known as craniosynostosis. The joint between the mandible and the cranium, the temporomandibular joint, forms the only non-sutured joint in the skull. In newborns and infants, the areas of connective tissue between the bones are much wider, especially in those areas on the top and sides of the skull that will become the sagittal, coronal, squamous, and lambdoid sutures. These broad areas of connective tissue are called fontanelles. 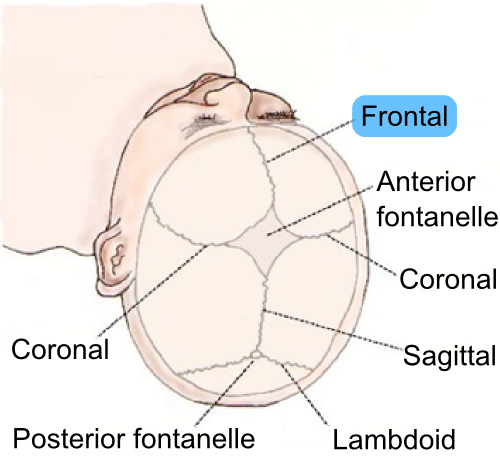 During birth, the fontanelles provide flexibility to the skull, allowing the bones to push closer together or to overlap slightly, thus aiding movement of the infant’s head through the birth canal. After birth, these expanded regions of connective tissue allow for rapid growth of the skull and enlargement of the brain. The fontanelles greatly decrease in width during the first year after birth as the skull bones enlarge. When the connective tissue between the adjacent bones is reduced to a narrow layer, these fibrous joints are now called sutures. At some sutures, the connective tissue will ossify and be converted into bone, causing the adjacent bones to fuse to each other. This fusion between bones is called a synostosis (joined by bone). Examples of synostosis fusions between cranial bones are found both early and late in life. At the time of birth, the frontal and maxillary bones consist of right and left halves joined together by sutures, which disappear by the eighth year as the halves fuse together to form a single bone. Late in life, the sagittal, coronal, and lambdoid sutures of the skull will begin to ossify and fuse, causing the suture line to gradually disappear.